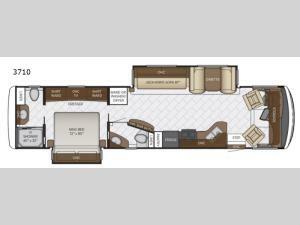 When you choose to travel with this 3710 class A Canyon Star motor home you are choosing luxury and comfort. 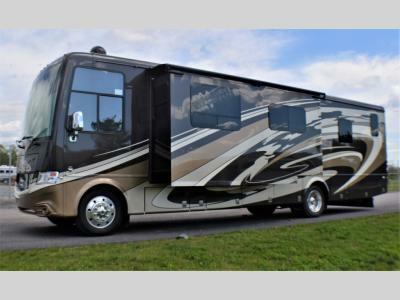 There is a convenient half bathroom mid-coach, and in the rear you will find the master bathroom with a 40" x 32" shower, sink, and toilet. The double slide outs help to open up the floor space throughout this model. Within the roadside slide out you can sit and visit with your family at the 87" jack knife sofa and dinette while watching TV. At night head to the master bedroom where you will find a king bed.